The high performance luminaire is designed for retrofit applications into existing acorn style luminaires replacing traditional and less effecient light sources without comprimising the quality of the delivered light. The heavy duty housing is constructed of die-cast aluminum. The optical assemblies are secured in place for weather tight protection. 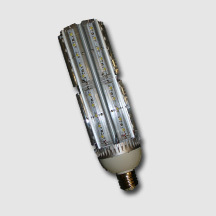 The LED’s are positioned in a manner to provide 360° uniform illumination. Available in up to a 75W configuration which provides approximately 6300 lumens of Cool White light. Auto-ranging multi-volt (100V~305V) input remote driver. THD≤12%. 0-10 PWM Input. Manually dimmable with a 250K variable resistor (provided by others). Exceptionally long life LED’s and driver. Rated for >50K hours of operation. 50’ max remote distance between screw-in retrofit unit and driver. The retrofit unit is designed to screw directly into an existing 4KV mogul base porcelain socket. A medium base reduced length version is available. The LED driver housing comes with universal mounting plate that allows it to be mounted where the existing HID ballast was housed (hardware provided by others).